That can enhance your cleaners’ output & provide your business with excellent value. Boost the cleaning power of your business. Get the cleaning products that provide performance! 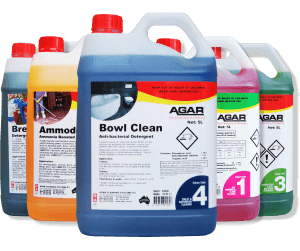 Agar offers its clients quality commercial and industrial cleaning products that are ultra-concentrated and packed with an unprecedented level of value. Get the job done first time – no re-application! Ultra-concentrated chemicals go a long way! Improve your chemical management and dosage accuracy while reducing spills and wastage with Agar’s range of reliable and easy to use, pre-labelled dispensing systems. Get your team the best technical support and responsive advice available. Agar’s technical support staff are experts in cleaning and problem solving. Trust in Agar’s ability to consistently deliver high quality products when and where you need them. All chemicals are manufactured in a facility that has certified quality systems. Speed up and simplify your ordering processes with Agar’s online ordering system. It’s quick, easy and accurate! Get covered with Agar’s range of OH&S support material to assist you in complying with the Occupational Health and Safety Guidelines and Government regulations. Train your staff in chemical safety quickly and effectively with Agar’s free online or onsite chemical awareness and safety programs. 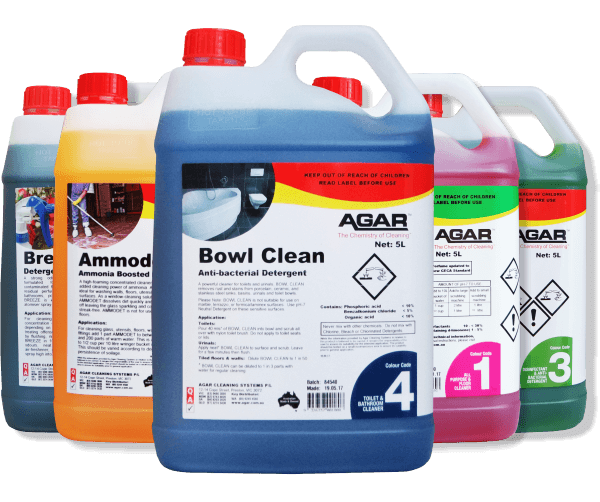 Agar’s high performance cleaning products and cleaning supplies are available from their warehouses in Melbourne, Sydney, Adelaide or Brisbane as well as from a huge network of cleaning product distributors around Australia.